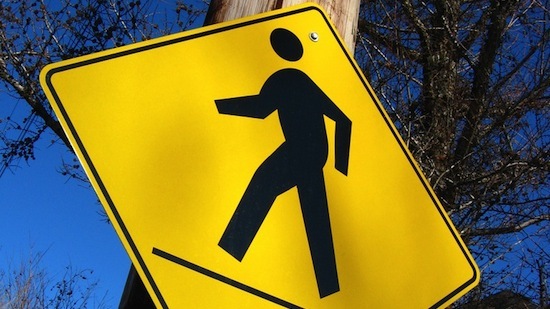 The first Wednesday of April is National Walking Day – this year, it falls on April 5. The spring day is dedicated to setting aside at least thirty minutes for a walk and giving your heart a dose of exercise. Behind the wheel isn't the only place a cell phone can distract you. According to researchers at the University of Washington, nearly one-in-three people choose not to put down their phone when crossing the street. If that's not startling enough to make you leave your phone at home on your walk, note that pedestrian fatalities have been up 3 percent in Pennsylvania since 2010, and teen pedestrian fatalities are up 13 percent across the United States since 2013. While those figures do not directly correlate with distracted walking, widespread mobile technology could very well be an influence. Everyone has had that heart-stopping feeling when you're driving along in the dark and you suddenly see a pedestrian on the side of the road. We drive away thinking, "I could hardly see that person! I could have hit them! What were they thinking, walking there in the dark?" Think about that scare before you take your own walk at night. Now that we've sprung forward and the sun is staying out longer, there's no excuse: Take your walk in the daylight. If you do fancy a late-evening walk, or just can't avoid it, wear bright clothing and reflective materials. Always stay on the sidewalk if one is available. If one isn't available, use extra caution, stay off of highly trafficked streets, and watch for obstacles such as parked cars and trees that can prevent drivers from seeing you. When it's necessary to cross a street, think back to preschool and what you may have taught your kids: Look left, look right, and look left again. Even if you have the right-of-way, don't trust drivers to stop for you. Trust us, we're on your side here – drivers should be alert. But they just won't hear you from inside their car when you throw up your hands and say, "Hey! I have the right-of-way!" Trying to impress your friends or a sweetheart by living on the edge? National Walking Day just isn't the time or place. Be sure to obey all traffic laws, or else you could make yourself vulnerable to serious injury. Cross at crosswalks, don't "J-walk," obey traffic and pedestrian signals, and never try to dash across the street and "make it" when you don't have the walk signal. Leave the road-rule-breaking to the movies, and instead impress your peers with your knowledge of traffic rules and regulations.